New York prosecutors investigating the case of bribery at The United Nations continue to move aggressively in their pursuit of the criminals in high places. Fresh from having Francis Lorenzo plead guilty on charges relating to his role in the bribery scheme involving Chinese billionaire and Roosevelt Skerrit's good buddy Ng Lap Seng, US Attorney for the Southern District of New York Preet Bharara has obtained an indictment and charged Julia Vivi Wang, aka "Julia Vivian Wang, aka "Vivian Pink", aka "Wang Wei" on one count of Conspiracy to Commit Money Laundering and one count of Money Laundering. In the sealed complaint, which MiTC has received, the prosecutors give us a glimpse of what the charges are relating to Ms. Wang. Prosecutors allege that on or about April 2013, Ms. Wang knowingly transported money from the United States and China to Trinidad and Tobago to "effect bribery of one or more Antiguan officials". The FBI's investigation revealed that Ms. Wang agreed to and did pay at least US $500,000 to purchase Antiguan diplomatic positions for her late husband and another Chinese businessman, referred to as "CC-1" in the complaint. The bribe is said to have been solicited and facilitated by the then Permanent Representative of Antigua to the UN, and by Francis Lorenzo, the Deputy Permanent Representative of the Dominican Republic at the time. 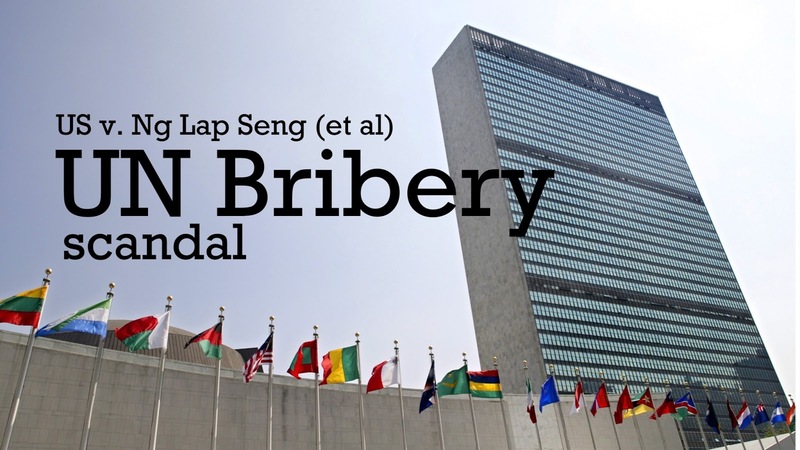 To conceal the bribe, prosecutors allege that Ms. Wang and her co-conspirators used US bank accounts of and affiliated with a New York-based non-governmental organization (referred to as NGO-2 in the complaint), of which Ms. Wang served as an officer, and "which was purportedly established to promote the UN's development goals and sustainable development". Although not named specifically, we suspect the prosecutors are referring the South-South Cooperation Office once headed by Lorenzo. The complaint states that Ms. Wang paid the Antiguan Ambassador out of the bank accounts of NGO-2, received money from China into a bank account of NGO-2, transferred that money into the bank account of an affiliated entity, and then transmitted that money to Trinidad and Tobago in exchange for the diplomatic positions that her husband and CC-1 sought and received. Here's how prosecutors say the plan was hatched and implemented as detailed by FBI Special Agent Jason Alberts. a. JULIA VIVI WANG, a/k/a "Julia Vivian Wang," a/k/a "Vivian Pink," a/k/a "Wang Wei," the defendant, and WANG's husband, informed Lorenzo that, in sum and substance, they sought to obtain at least an official diplomatic position, such as a consul or envoy, because they viewed such a position as a business opportunity. Specifically, they indicated that they believed that such a position would permit them to make money by assisting others to obtain so-called "economic citizenship" (that is, citizenship available to individuals who invest a certain amount in a country) and by arranging for business deals, which they could facilitate through such a position. WANG and WANG's husband further expressed, in sum and substance, that they were willing to make payments in connection with obtaining such a position. b. Lorenzo agreed to and did assist WANG and WANG's husband to obtain such a position for WANG's husband and for CC-1 through the Antigua Ambassador, in return for hundreds of thousands of dollars paid by WANG. Lorenzo understood from speaking with the Antigua Ambassador that at least a portion of the money was meant to pay off one or more Antiguan officials, including the then-Prime Minister of Antigua, in exchange for those officials approving the granting of the diplomatic positions. Based on my participation in the investigation, I have learned that the foregoing and other information provided by Lorenzo has been corroborated in multiple ways, including emails and financial records, as set forth in greater detail below. a. On or about April 17, 2012, the Antigua Ambassador sent an email to Lorenzo which stated in pertinent part: "You will recall that Vivian had said there were two guys who were interested in becoming our HC [honorary consul] in Hong Kong. If this is true, and if both are truly interested then perhaps one could choose Hong Kong and the other Shanghai. Assuming that this is possible I will need to get the folks at home [to] focus on this as soon as possible. For that to happen here's what I would need from each gentlemen to send me an email along the following lines: . . " This message was followed by a draft email addressed to the Antigua Ambassador that stated, among other things: "As we have agreed in our discussions, and in an effort to demonstrate my commitment to getting the process of consideration and subsequent approval by the relevant authority of your government underway as quickly as possible, I am prepared to make a contribution of US $ 250,000 immediately available, and upon my appointment to the aforementioned post, a similar amount of US $250,000." The draft email further proposed an additional yearly payment, "pending successful evaluation [ ] by your government on my effectiveness in delivering tangible opportunities from business enterprises in Hong Kong/Shanghai." b. On or about July 31, 2012, Lorenzo sent an email to WANG' s husband, addressing him by his first name, stating, "enclose [ d] see the letter that is needed for the honorary consulate." Following this sentence was a draft email, which was addressed to the Antigua Ambassador, and which largely matched the one that the Antigua Ambassador had sent Lorenzo on or about April 17, 2012, except that it spoke of a "contribution" without specifying the dollar amount. d. In subsequent weeks, the Antigua Ambassador sent an email to Lorenzo, to be provided to CC-1, concerning CC-1' s interest in serving as a representative of Antigua, and proposing to meet in Hong Kong in January. Lorenzo forwarded the email to WANG' s husband. e. On or about January 9, 2013, Lorenzo sent an email to WANG's husband in which Lorenzo stated, "as per our last meeting enclose see letter as a follow up." The email attached a letter from Lorenzo, on the letterhead of NG0-2, thanking WANG' s husband and CC-1 for their interest in serving as representatives of Antigua, and proposing that "it would perhaps be in our mutual interest to identify the resources and funding needed and the areas of mutual benefit." f. On or about February 15, 2013, WANG wrote a check for $25,000 to the Antigua Ambassador from an account of NG0-2 in New York, New York (the "NG0-2 Account"). g. On or about February 25, 2013, WANG sent an email to the Antigua Ambassador, addressing him by his first name, which stated, in pertinent part: "Attached docs are the letter from [first name of WANG's husband] And the Bio for [CC-1) [.] You may have any question pls [l) et me know. All the best . Vivian" The email contained an unsigned letter from WANG's husband, "formally confim[ing]" his interest in serving as an "Economic Envoy" of Antigua, stating that he was "pleased" that CC-1 "agreed to join me in this endeavor," and further stating that WANG' s husband would "proceed to make the agreed contribution (US$ half million)." h. Approximately three hours later, WANG sent an email to the Antigua Ambassador with no separate text but that attached a signed version of the letter from WANG's husband. i. On or about March 6, 2013, the Antigua Ambassador sent an email to WANG, stating in pertinent part, "please find attached the formal response to [first name of WANG's husband)'s letter of 25 Feb." The email attached a letter, on Antigua Mission to the UN letterhead, from the Antigua Ambassador, in his capacity as "Ambassador I Permanent Representative," to WANG' s Husband, informing him that Antigua was going to open an "Investment Office" in Hong Kong and that he would be appointed Economic Envoy/Honorary Consul. j. Later the same day, an individual, using an official Antigua email account, sent to the Antigua Ambassador two commissions, signed by the then-Prime Minister of Antigua, one for WANG' s husband, and one for CC-1, appointing WANG's husband the "head of the Antigua and Barbuda Investment Office (ABIO) in Hong Kong, SAR, China, in the capacity of Economic Envoy," and appointing CC-1 the Deputy Economic Envoy in the same office. k. Approximately two weeks later, on or about March 19, 2013, CC-1 caused a wire, in the amount of approximately $500,000, to be sent from China to the NG0-2 Account. l. On or about April 1, 2013, the Antigua Ambassador sent an email from his official UN email account to his personal email account, containing information for a certain bank account in Trinidad in the name of a company (the "Trinidad Company" and the "Trinidad Company Account") . Based on its name, the Trinidad Company appeared to be a publisher of educational materials. m. The following day, WANG sent an email to the Antigua Ambassador with the subject line, "RECEIPT." The email contained no separate text, but attached a wire transfer form, indicating that WANG had authorized $500,000 to be sent from NG0-2 to the Trinidad Company Account. The form stated, under "Information for the Beneficiary," that the payment was "From: [WANG' s husband), [CC-1] ". n. Over the next few months, the Antigua Ambassador, Lorenzo, and WANG traded a number of emails that discussed setting up the Antigua Investment Office in Hong Kong and obtaining diplomatic passports from Antigua for WANG' s husband and CC-1. During the same period, WANG informed the Antigua Ambassador, among other things, that WANG's husband had arranged for a "nice suit for you in [Hong Kong]," which the Antigua Ambassador could pick up on his next visit. a. Rather than transmit $500, 000 directly from the NG0-2 Account to the Trinidad Company Account, WANG first transferred $ 500, 000 from the NG0-2 Account to a bank account of the Development Fund, also in New York, New York, and then, one day later, wired $500,000 from that account to the Trinidad Company Account. b. Subsequent to the $500,000 arriving in the Trinidad Company Account, sums of money were wired from the Trinidad Company Account to various accounts, including money that was sent back to bank accounts in the United States belonging to or affiliated with family members of the then-Minister of State in the office of the Prime Minister of Antigua. Based on my training and experience and my involvement in this investigation, none of these transfers appears related to the apparent mission of the Trinidad Company, namely, publishing of educational materials. c. Starting less than two weeks after WANG wired money to the Trinidad Company Account, the Antigua Ambassador began to receive $10, 000 a month from NG0-2 by check, nearly all of which were signed by WANG. Based on my participation in the investigation and my training and experience, I am not aware of a legitimate reason for NG0-2 to receive money from abroad into a business bank account, transfer it to a second business bank account, and then transfer it back abroad to a third business bank account in an approximately two week period. a. Individual-1 was not aware of the Development Fund bank account used by JULIA VIVI WANG, a/k/a "Julia Vivian Wang," a/k/a "Vivian Pink," a/k/a "Wang Wei," the defendant, to send funds to the Trinidad Company Account. Individual-1 also was not aware of any relationship between the Development Fund and the Trinidad Company. Based on my review of financial records and my conversations with another law enforcement officer, I have learned, in substance in and part, that between in about August 2014 and in or about January 2015, after WANG' s husband passed away, JULIA VIVI WANG, a/k/a "Julia Vivian Wang," a/k/a "Vivian Pink," a/k/a "Wang Wei," the defendant, transmitted more than $200, 000 from the Development Fund to a company in California to pay for WANG' s husband's cemetery plot and/or related expenses. Based on my interviews of Indi vidual-1, I have learned that Individual-1 was also not aware of these payments. Based on my review of legal documents, I have learned that bribery of a public official is illegal in Antigua under the Prevention of Corruption Act, which was enacted by the Antiguan Parliament on or about November 5, 2004. Ms. Wang was released on a secured $1.5 million bond (her home in California was put up) and was ordered to surrender her travel documents. She also must submit to electronic monitoring and her travels are restricted to the jurisdictions of the Southern and Eastern Districts of New York. She is represented by attorney Raymond Wong. MiTC will continue to monitor this and other cases relating. We can only wonder; will it reach our shores? You will recall the key players in this bribery scheme, John Ashe, Francis Lorenzo and Ng Lap Seng were all together last August in Macau signing MOU's relating to the same South-South Office and developments that were proposed. 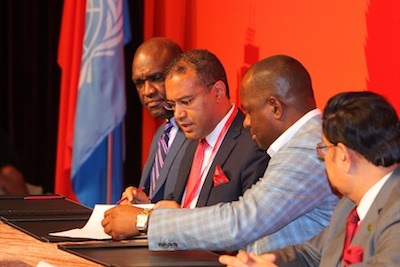 Two days before Tropical Storm Erika struck Dominica, Mr. Skerrit was photographed signing documents, the details of which are yet to be released, but a statement from the event indicated that Mr. Ng had agreed to construct a technology center in Dominica that would serve the Caribbean and Latin America. The project was supposed to have been developed by Mr. Ng's Sun Kian IP Group. We understand that Mr. Ng has been indicted and is presently under house arrest in New York, but his massive company is still in operation. Should we expect the company's directors to pursue Mr. Ng's vision of a technology center in Dominica? We know the answer to that question, but it doesn't hurt to ask, right? Stay tuned. Lap Seng visited President Clinton more than 10 times in the White House.